This guide will show you how to add a table of contents to your WordPress posts. Particularly useful for guides, FAQ pages or any long form content marketing on a budget. It’s really easy to implement, you just need tiny bit of HTML & CSS knowledge and the ability to copy and paste. What is a Table of Contents? 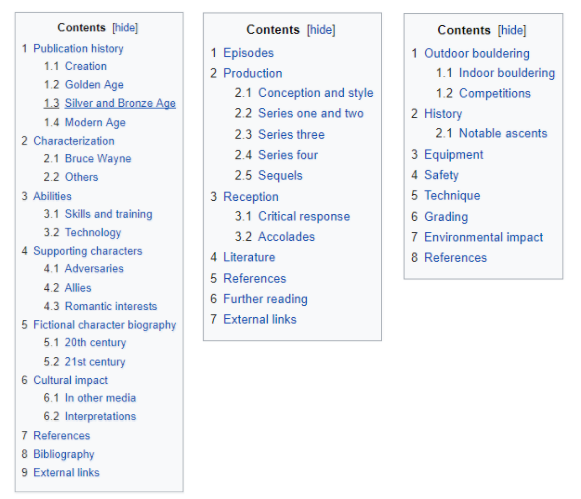 A table of contents ( or TOC), is a list found on a page before the start of the main content. The table will show the different section title with a clickable link that will jump you to the relevant subheading. Why is the table of contents important? People skim when reading on the web. Think about when you read a large block of content. You scan for headlines. I know I do. So make it easy for readers and just give them the headlines. This way they can’t miss what they are looking for by scrolling past it. This is where a table of contents comes in. There’s this small site that ranks for a few terms (ranks #1 for about 56% of searches). I think it’s called Wikipedia. Notice there’s a table of contents on every single page. I’m not saying this is the sole reason for Wikipedia’s success. But it wouldn’t be there if it wasn’t providing users value. It’s easy to see how a TOC can improve user experience. But can it improve SEO? This is a loaded question. And one that’s impossible to answer as it depends so much on the site, niche, competition etc. You don’t need to include the entire long tail, Google’s algorithm is clever, it knows what the subheadings refer to within the context of the page. What’s more, Google likes data in tables and often uses this data for the featured snippet. Regardless of whether or not having a table of contents improves rankings, you should use them because they help users navigate long content better. Ignore Google. Focus on your readers. Follow the instructions below to generate your own TOC for WordPress. If you are using the Genesis Framework (which I strongly recommend) you can just go to the built-in CSS module and paste in the code. Alternatively, you can add the CSS code into your theme’s stylesheet file. If you are not sure how to do this, avoid breaking anything and use a CSS plugin like Simple CSS to inject CSS code without altering any of your core files. The good thing about this method is if you aren’t that comfortable with CSS, it’s quite easy to remove if things go wrong. Now that the CSS code is in place, you can use HTML code to create a ToC in any page. You are basically making a list of links that are in the page. The table of contents (controlled by OUTPUT 1) – these are the TOC links that will appear at the top of your page. 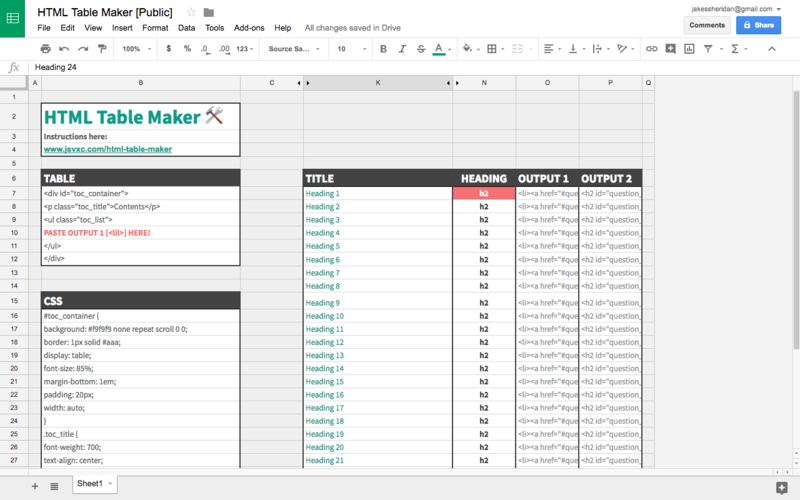 The titles (controlled by OUTPUT 2) – these are the title anchors for the table links. Go to the post you want to add a table to. Copy the subheadings you want to include in your table of contents. Paste these into the TITLE column. Once you’ve added your titles, the rest of the code you will populate in OUTPUT 1 and OUTPUT 2. You should now have a table of contents. Click on preview to make sure it is showing. To make the links actually take you to the relevant sections, it’s time for some copying and pasting. Are you sitting comfortably? Good, because now it’s time to copy the code for each heading and replace your post headings with it. It’s a bit tedious but it doesn’t take that long really. Once you’ve done this, check that the links take you to the right section. You are now the proud owner of a table of contents.